Step up kids. It’s time to get the soup on. Lets do this! Today we are putting together some tomato basil soup. We will also toss in a couple of roasted red peppers for a special touch. Tonight we have soup, tomorrow we use leftovers for a sauce. But first things first. On to the soup. To get things going let’s start with flavorful mire poix. What is that you ask? It is a combination of vegetables that are gently cooked. A mire poix is a great base on which to start layering your flavors. I diced up some green onions, celery and some carrots. I also diced some garlic, but that needs to be added in later. First things first. Its okay to give these veggies a rough chop. We will smooth this out in a bit. Get your big soup pot out and heating up over a medium heat. After it warms up for a few minutes add some good quality olive oil. When your oil is heated up toss your veggies into the pot-but hold off on that garlic for a bit-it burns easily so we will ease that into our soup later. Give the vegetables a good stir. Add salt and pepper. I like to have a salt and pepper mix close by when cooking. The vegetables will soften and become fragrant. Let them cook for 4-5 minutes and then add the garlic. (Garlic is lovely when roasted but when it burns-well not so much, so it needs to be added right before the tomatoes). Keep stirring gently, and let the garlic cook for about 2 minutes. Now we will add good Italian tomatoes and some roasted red peppers. Add the entire contents of the tomatoes to the vegetables in the soup pot. With the peppers, take them out of the oil before adding to the vegetables. Keep the heat at medium, stir this all up, and enjoy seeing this bubbling goodness come together. The fragrance filling your kitchen will give you a reason to stand there and do some deep breathing. Yum. Let this simmer for 20 minutes or so, stirring every so often. Then get ready to add another layer of flavor to your soup. Now we add the chicken broth. If this will be a vegetarian soup, feel free to add vegetable stock instead. The soup will delectable either way. Also add parsley and a sprinkle of salt and pepper. I like a little heat, so I also add red pepper flakes, but that is optional. The winter soup delight is coming together perfectly. Time to add the basil. 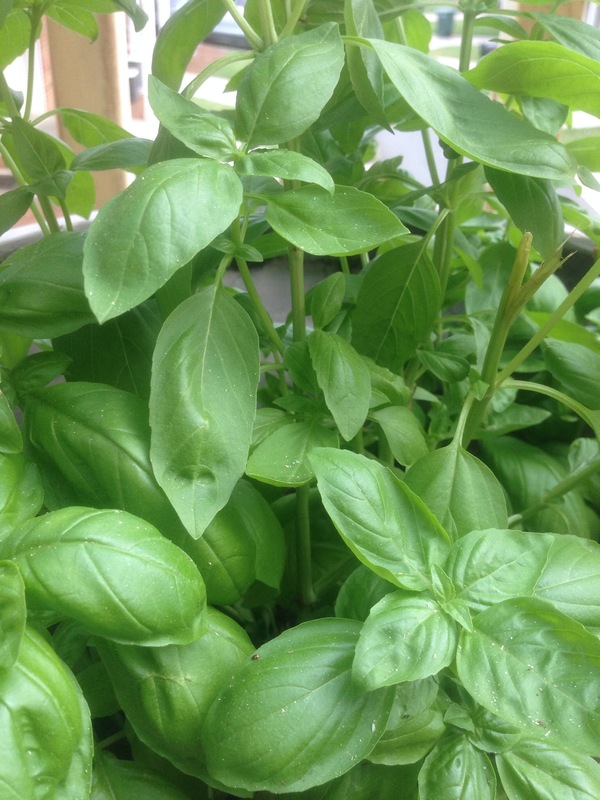 I grow basil in my summer herb garden, but since it is winter I bought some. 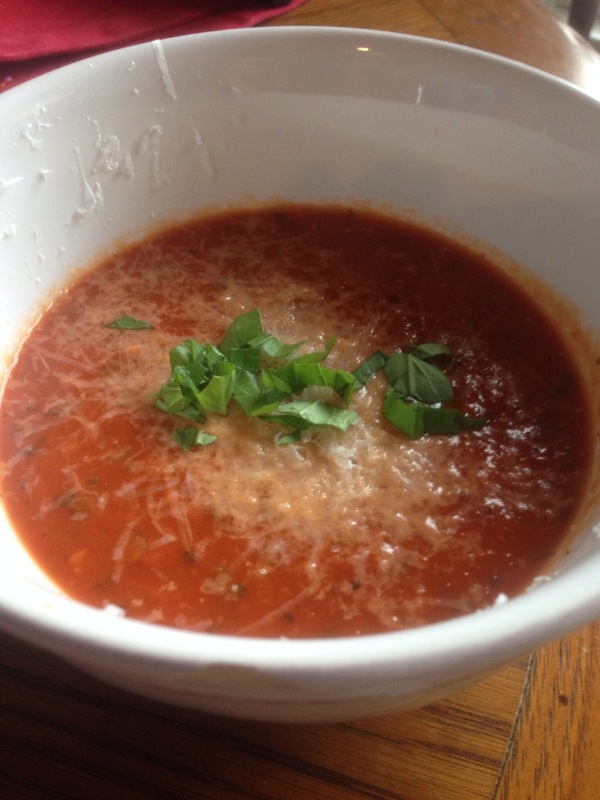 Fresh basil is worth it in this soup so get it fresh if you can. Pull the leaves gently off of the stalks and give them a rough chop. We will use an immersion blender to cream the soup later, so don’t worry about your knife skills. Add the basil to the soup and stir. Grab your immersion blender. Don’t have one? Invest in one. I use mine for everything from smoothies to vinaigrette to soups and sauces. This kitchen tool is essential. Put your immersion wand into the soup and blend away. Be mindful of the hot soup and do not allow it to splatter. You can also put the soup in the blender to smooth out, but be very cautious, go slowly and do it in batches to avoid burns and accidents. I using a blender pour the soup back into the pot. Let the soup simmer while you get your soup bowls out. Fill your bowl up, garnish with fresh parmesan cheese and basil, then get ready for tasty greatness. Keep your eye out for my next blog. We will explore ways to use your leftover soup-if you have any! The other day I had two things: a lot of good fresh vegetables and a little extra time. So why not roast up those vegetables! I started peeling, chopping and layering. This was going to be a big honking batch of veggies! Mushrooms, bell peppers, squash, onions…Yum! A big batch it was. My largest kitchen bowl was full of colorful vegetables. What next? I dusted the vegetables with salt and pepper. I sprinkled basil and parsley on the vegetables as well. Olive oil and a bit of balsamic vinegar completed the prep work. After a good healthy stir, I poured them onto a lined baking dish and placed them in a preheated 400 degree oven. Almost immediately, warm succulent aromas began to fill the air. My mouth began to water with those decadent scents wafting from the oven. I checked the vegetables after 15 minutes in the oven and couldn’t resist sneaking a taste. What a delicious bite! Back into the oven for a few minutes, and then they were ready. The roasted veggies were delicious that night for dinner with lovely grilled salmon. Did I mention that it was a big ol’ batch of roasted veggies? And that I love leftovers? Did we ever have leftovers! And like spaghetti, the vegetables were better the next day. How did they get used up? Leftovers day one: Roasted veggies made an amazing addition to an omelet the next morning. Leftovers day two: I cooked quinoa to mix into the vegetables. That created a protein and nutrient dense powerhouse that were perfect after a workout. Leftovers day three: Roasted veggies piled on a turkey sandwich. Who needs mayo? And that is what you do with leftovers my friends. When you have a bit of extra time, cook big. Then enjoy good food and time savings later! Let me know what you do with your leftovers! The other day I had two things: a lot of good fresh fall vegetables and a little extra time. So I went to my happy place…the kitchen. I decided to roast the vegetables. I started peeling, chopping and layering. This was going to be a big honking batch of veggies! Mushrooms, bell peppers, butternut squash, onions, celery…Yum! A big batch it was. After they were chopped, I dusted the vegetables with salt, pepper, basil, and parsley then sprinkled olive oil and a bit of balsamic vinegar on them as well. After a good healthy stir, I poured them onto a lined baking dish and placed them in a preheated 400 degree oven. Almost immediately, warm succulent aromas began to fill the house. My mouth began to water with those decadent scents wafting though the air. I checked the vegetables after 15 minutes in the oven and couldn’t resist sneaking a taste. Ooh! What a delicious bite! Back into the oven for a few minutes, and then they were ready. We enjoyed the roasted veggies with lovely grilled salmon. Did I mention that it was a big ol’ batch of fall veggies? And that I love leftovers? Did we ever have leftovers! But that’s okay. They were fantastic to have around. And like spaghetti, the vegetables were more flavorful as leftovers. Leftovers day two: I cooked quinoa to mix into the vegetables. That created a powerhouse side dish of veggies and quinoa. Leftovers day three: Roasted veggies piled on a turkey sandwich. Who needs mayo?? And that is what you do with leftovers my friends. I used a little extra time to cook big, and had nutritious leftovers to launch other dishes. Soup-Rich warm comfort food! Yum! Home made tomato basil soup. Easy and delicious! And the leftovers were fabulous. Tomato basil soup is a snap to make with just a few things on hand. I used canned tomatoes, but had fresh basil still going crazy in it’s sunny patio pot. I began by sautéing onions, celery, and garlic in olive oil. Next, in went some canned tomatoes to simmer for a bit. I use a variety of tomatoes depending on what is in the pantry. (Whole tomatoes are just fine to use if you have a stick or immersion mixer to smooth it out). Salt, pepper, and a dash of sugar is also necessary. I use both black pepper and red pepper flakes because I like a little heat in my soup, but you can be light handed with the pepper if that suits your personal preference. Even if using fresh basil, tossing in about a tablespoon of dried basil while the soup is simmering adds a nice flavor touch, and certainly adds to the succulent aroma. When the soup starts simmering, the amazing scents of tomatoes and basil begin wafting through the air. Pathetic true confession: sometimes when I am cooking and it starts to smell good in the house, I will go outside for a sec, then step back inside and let those incredible aromas hit me all over again. Fresh basil. The taste is amazing and the aromas are truly mouth watering! There are so many reasons to love soup. The house warms up with delicious lingering scents, and you can really customize it for your own taste and occasion. Add a little of this and a little of that. And soup is super budget friendly. Soup is also easily paired with a well toasted or grilled sandwich…the crisp texture of the sandwich is wonderful with the warm smooth soup. Very pleasing to the palate. Make it on the weekend and use the leftovers for a quick week night supper. Put olive oil in large stock pot. Heat briefly and add onion and celery. Sautee until soft, about 5 minutes, stirring constantly. Add garlic and stir for another minute. Gently pour in stock and simmer for 10 minutes, stirring twice. Add all tomatoes, tomato paste, ketchup, salt, pepper, sugar and dried basil. Give this a good stir. Turn heat to medium to low and let simmer for 20 minutes. Use immersion or stick blender to smooth out the texture, being mindful of the hot liquid. Taste for salt and pepper at this time and adjust for taste. Add fresh basil and let simmer on low for 15-20 minutes. You can whisk in the milk at this time if you choose. Garnish with freshly grated parmesan cheese and fresh basil. This is a fun recipe to tinker with. Feel free to make it more hispanic by adding cumin. Make it a little more greek by adding oregano. Go for it. Have a blast! Welcome fall into your family kitchen by adding this fabulous comfort food. 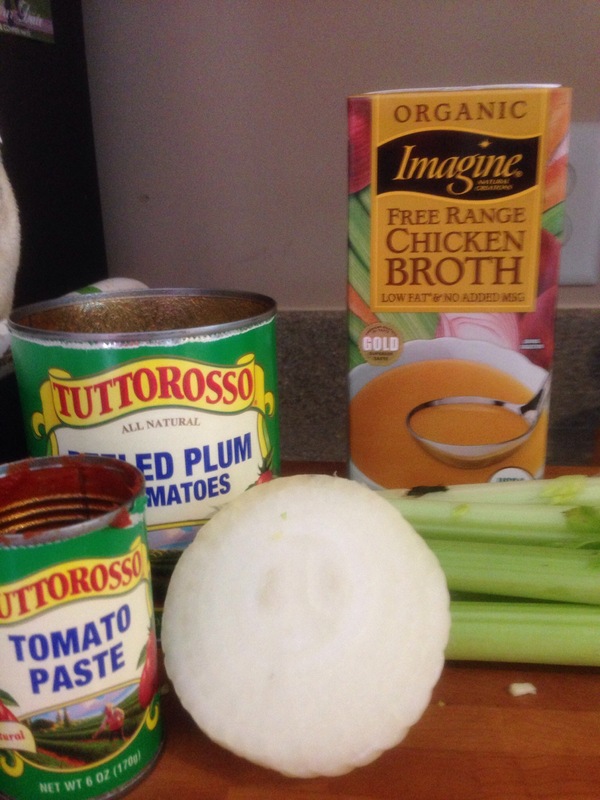 Try this soup, make it your own, and then shoot me a note to let me know what you did. I can’t wait to hear about your foray into fall comfort food! Our winter was cold, snowy, and the weather was, well, dreary. Spring has sprung, and it was a bit of a whimper, not a big bold leaping launch. Rats. I love spring, but our spring this year has limped in. Not with tulips and daffodils, but with gray skies and cold rain. I am not complaining, mind you, just missing the beauty and newness of spring this year. But darn glad that it is finally here. With gray skies above, imagine my excitement when I zipped down to the back yard for something and realized that my parsley was absolutely bursting out of the garden! I instantly forgot my purpose for having gone to the back yard and leaned over my garden. I blinked and blinked again. Yes! Not only was the parsley happily standing up to greet me, but so was the mint, the rosemary, and rocket arugula! Yum! I could not resist bending over, pinching off some leaves even though there was no imminent culinary purpose, and putting the herbs up to me face. I breathed in, my head went back, and it was a moanable moment. I try to have pots of herbs growing in my kitchen all year long (once in a while one of my foodie friends may sneak one out of my kitchen, so I have to keep more than one plant around!). My favorite thing to make with herbs is fresh pesto. It takes moments to prepare and can be used in many different ways. Flexible foods are my favorite, and pesto is super flexible. How flexible? Pesto can be liberally poured over pasta making a delicious side dish. It can be brushed onto fish, adding beautiful color and flavor to either delicate or hearty fish. I have doused chicken with pesto, adding flair to an otherwise bland weeknight dinner. Pesto can also be spread onto a sandwich as a savory condiment. I love the freedom to use my flavor packed pesto in or on most everything! It is simple and makes me look like a rock star in the kitchen at times. Who wouldn’t love that? FYI- I have tried using toasted pine nuts as well as roasted garlic and it did not make a notable difference in taste. I have also substituted walnuts for pine nuts, and the flavor was great. I have used both the parmesan cheese in the green can as well as fresh parmesan cheese, and fresh makes a difference. Use it if you can, but if you only have the green can on hand, go for it! I usually add a little more olive oil if I am putting this on pasta. If you are using dried herbs in a pinch, you also may want to increase the olive oil. Go ahead! Play with this recipe! Have fun and enjoy the amazing flavors! And don’t forget to make a big batch and freeze some for another night when time is short.